In the midst of all the festivities, I am reflecting upon the year gone by. 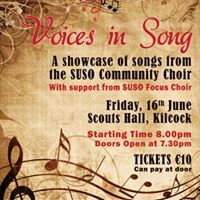 I awoke this morning with the words “community of SuSo” running around my head, and felt that it was a great way to describe what we are all creating together in Kilcock – building and strengthening our SuSo Community! 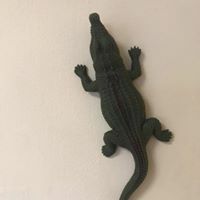 So here are a few memories for you all for sentimental reminiscence! We start back on our 2 year anniversary, buzzing back with New Year energy! Now we are approaching our 3 year anniversary and it’s amazing how quick time flies by! 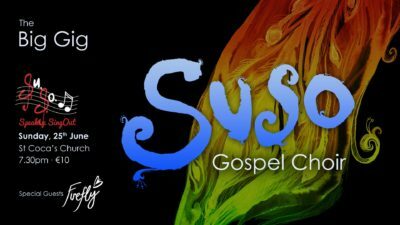 We begin our SuSo Homeschool Choir, which ran until the end of June, culminating in a performance of their original drama in June. 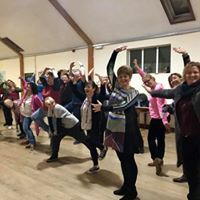 Our Community & Gospel Choirs do a spot of choreography with the wild and wonderful Mary Duffin. There is Only Love. Eimear and I get to work on a project very dear to our hearts, a night of original music by our dear friend Samuel Gaines. This was a night of love, joy and pure creation. The lovely Lea Miklody comes and serenades us to the sounds of the cello in her bespoke Comfy Concert. February sees another in the series of Singer Not Beginner Showcases in Gregorys, always a wonderful night of community supporting community to be wild and brave and free. Claire travels to Australia with the World of Musicals show – life can be tough sometimes! Ruari begins offering Sound Baths in the music school as part of our wellness program. These are run throughout the year in line with the sacred festivals of Ireland. Eimear records an album in St Kevin’s with the transition year program she has been working with. 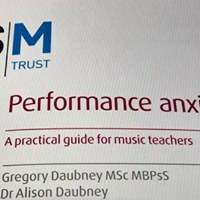 Eimear heads off to London to attend the ISM Conference, deepening her understanding of performance anxiety in music. We all accept that we will be the focus of her PhD research some day! 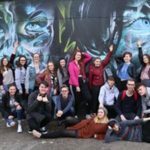 Our Youth Choir go on their first big road trip, down to work with Phil Brennan, musical director of the High Hopes Choir in Waterford. We also experience a Taize Mass whilst in Waterford, giving us all a new way of experiencing music as a meditation. 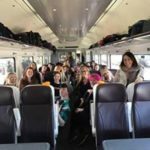 You can read Claire’s blog on the trip away. 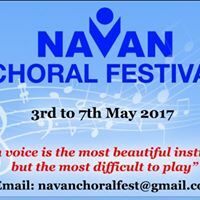 We head off to participate in the Navan Choral Festival, with our youth, gospel and community choirs, getting to hear other choirs do their thing, inspiring others and being inspired. 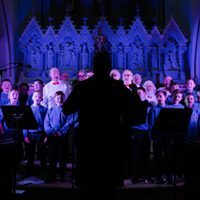 Following on from our experience at the Taize mass, we do our first Singing for Peace concert in the Little Chapel with our youth choir. 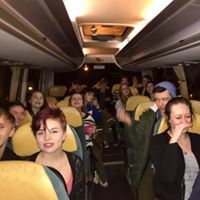 This was a wonderful evening as the teenagers shared their experience of peace from the Taize mass with the local community. Claire launches Music Medicine Level 2, allowing the participants who had completed level 1 to deepen their experience of the power of sound. 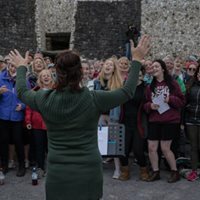 Half of Kilcock heads off to the Gospel Rising Festival for another year of choral madness! The Gospel Choir do their Big Gig, supported by Firefly who performed a breathtaking set. Our young piano, guitar & vocal students do their Summer Showcase which was so big we had to rent a bigger space! 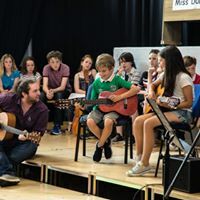 Scoil Ui Riada’s hall is filled with wonderful music, as one by one our young students brave the stage and share their music and hearts. Another Singer Not Beginner Showcase takes place, with more participants having their next step on the ladder of performance being witnessed with love and joy by the community. Our Youth Choir perform in Vantastival, packing out the big tent on a Sunday morning, to a wild and happy bunch of festival go-ers. It’s the Month for Summer Camps!!!! 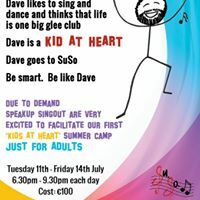 Dave Ralph becomes the featured image on our poster launching Kids At Heart, our first ever summer camp for Adults! What a week we had, even writing an original song which is due to be recorded and released in 2018. Our teen camp write an original musical called Boxes, a truly inspiring piece of work. One of our students Saoirse Lawlor, aka Beatrix Nova, launches her first EP, Terra, on her 16th birthday. What a singer, what a songwriter, all round musical brilliance! Claire and Eimear take a well deserved break! Eimear heads off to Thailand, Cambodia & Vietnam, and Claire heads off to Spain. 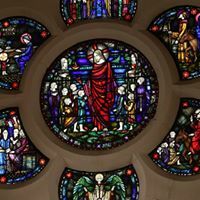 Time for renewal! 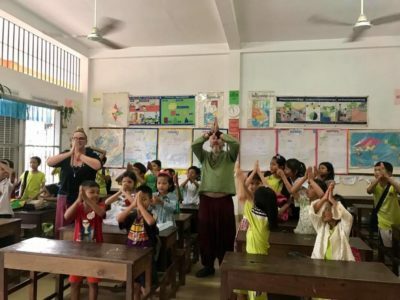 Eimear does very well to take 3 weeks off, but is spotted doing a sneaky bit of work whilst away – spreading the music with a children’s school. 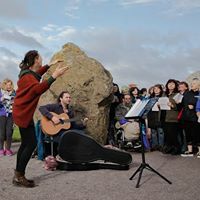 Claire facilitates the Newgrange Dawn Chorus, and a great crowd heads off from Suso at 6.30 in the morning, and sing their hearts out at the ancient monument, accompanied by Dave McDonald on guitar. What a great experience! 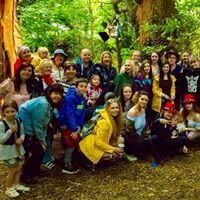 Annah Knight shares her creative joy with children at the Wild & Magical Journey art camp. 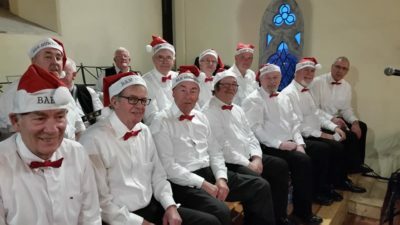 The Men’s Shed Choir sing at Kilcock GAA. 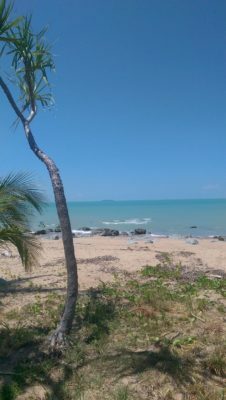 Have You Ever Been to the Waterspout… Alfred comes to Suso! Look Who’s Talking Now choir gets launched. 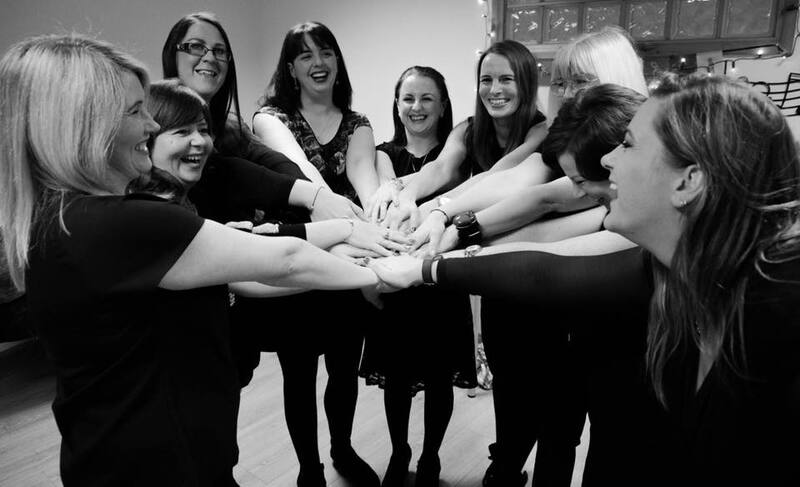 This is a choir for parents of babies who want to get back to expressing their own voices. Claire does her Album Launch as part of Culture Weekend. 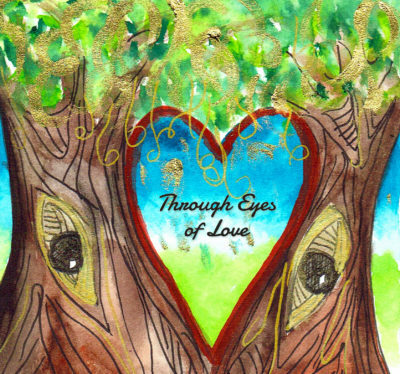 Her album Through Eyes of Love is available on all the usual sites. 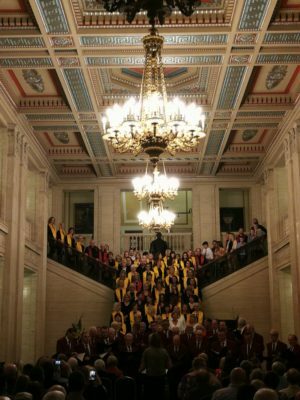 With our gospel and community choirs we head off on a trip away to Belfast to Sing at Stormont with the Harlandic Male Voice Choir. What a special weekend to sing in such a beautiful and historic place, and no doubt the resonance of the music impacted on the whole space. The Mum to Mum Support Group has it’s 1st anniversary. 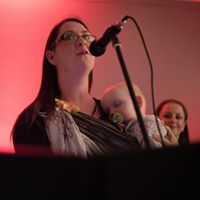 This wonderful support group was established by our sister Ailish and provides a great service to mothers in the area. For more info, please contact Ailish on 087 3526406. The month begins with our Youth Choir recording their album, Stereotyped with John Leader. 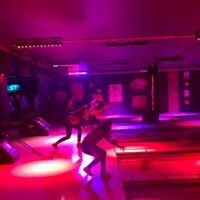 Another Singer Not Beginner Showcase takes place in Gregory’s. 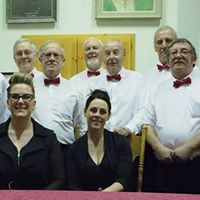 The Men’s Shed Choir do their concert, Community Connections. These men are going from strength to strength with each passing week. This year they did an intergenerational project with the 5th class boys from St Josephs. During the course of the project, facilitated by Eimear, the boys got to meet the men and see the Men’s Shed, developing connections that will last a long time. 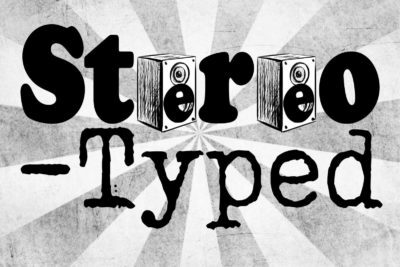 Suso Youth Choir launch their album Stereotyped. 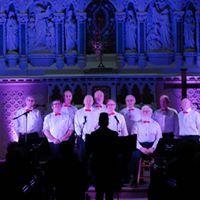 All monies raised go towards funding their trip to the Young Bohemia Choral Festival in Prague in March 2018. To purchase the album, please contact Eimear / Claire on 086 1757636 / 086 1923381. 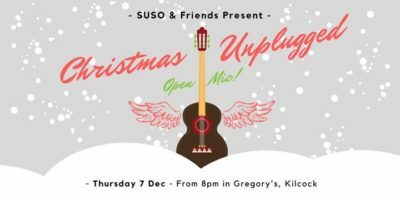 Heidi organises Christmas Unplugged, an open mic night in Gregory’s which was a great success. 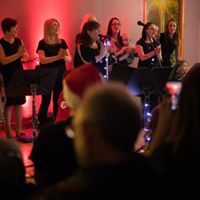 The newly formed choir for mums do their first concert Look Who’s Singing Now, which was doubly special for us as a family, as we watched Ailish share her beautiful voice on stage for the first time in years. 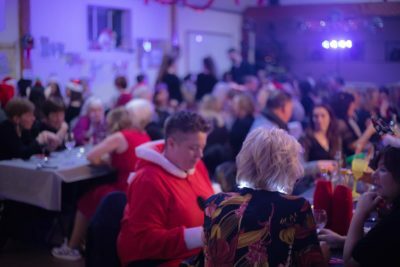 We have our annual Christmas Party in the Scouts Hall which was a wild success! 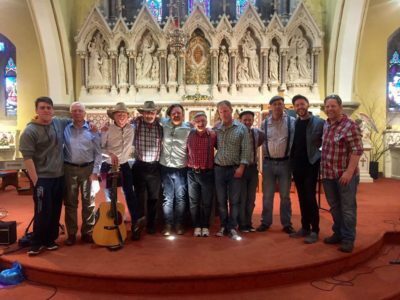 The Men’s Shed Choir head off to the Pearse-Lyons Distillery in James Street to perform with the newly formed choir from local company Alltech. We are treated amazingly well, with whiskey-tasting, a pint in the pub next door, and a very happy Claire who gets to play on a Kawai grand piano! 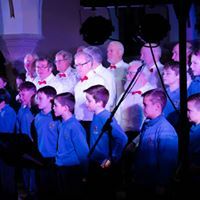 Suso Choirs and the Rye River collaborate again for the Annual Carol Singing in the Square, raising over €2,000 for the wonderful Peter McVerry Trust. The guitar students do their Christmas showcase. The school closes, but not before the Men’s Shed perform at the moving crib in Enfield on Christmas Eve. Upon reflection, I see that we’ve been slightly busy all year. We want to acknowledge how much joy you all bring us as our community grows, deepens, flows, changes, adapts, strengthens and transforms. So enjoy the festive season. 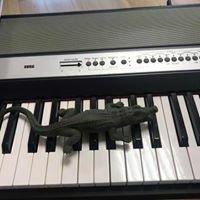 Take the time to deepen your connection with those in your life, and to share music where possible! Make someone smile by singing to them in the supermarket, or on the street! And if anyone tells you that you’re strange, send them down to us at SuSo and we’ll get them singing along in no time!